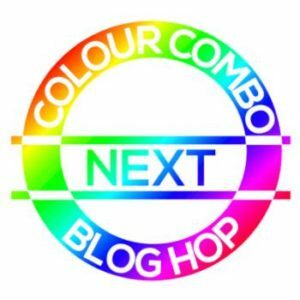 Today I am taking part in another colour challenge, with other Independent Demonstrators, as part of the Colour Combo Blog Hop. I am based in Cambridgeshire. In this month’s blog we have been given certain colours to use. 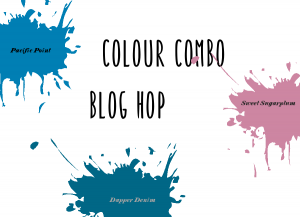 The colours for this Blog Hop are: Sweet Sugarplum, Dapper Denim and Pacific Point. Sweet Sugarplum and Dapper Denim are two of the 2016-2018 In Colors and will be retiring at the end of May 2018. Sometimes after a busy day at work it is nice to come home and retire to my craft room to relax. Today was such a day and I decided to use of my favourite stamp sets – Flower Shop. It comes with a matching punch – Pansy Punch. The Flower Shop stamp set has 5 different flower stamps and today I have chosen to use one that has not been used as much as the others. 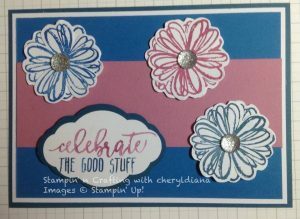 One thing I love about Stampin’ Up! is that all the products match, from card stock to ink pads and marker pens. For the base I chose Dapper Denim and mounted a Whisper White base on top of it. The next layer is Pacific Point, this is a lovely bright blue and to break up the Pacific Point card stock I added a Sweet Sugarplum strip. I then stamped and punched two flowers in each colour and stuck one on top of the other to make a double flower. These were placed randomly on the card base. As I have mentioned above I love how Stampin’ Up! matches their products. I chose a sentiment from the Picture Perfect Birthday stamp set and decided to use matching Marker Pens to colour in the stamp using the 3 colours. This was then stamped onto Whisper White card stock and backed using Dapper Denim as a border using the Pretty Label punch. I hope you have enjoyed the card that I have shared with you today. We do appreciate reading your comments on our posts. The pansies are my favorites! I enjoyed joining in. Its my first time taking part with this blog hop.